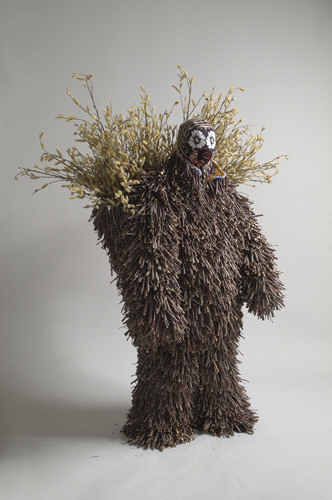 Whether Nick Cave's efforts qualify as fashion, body art or sculpture, and almost regardless of what you ultimately think of them, they fall squarely under the heading of Must Be Seen to Be Believed. 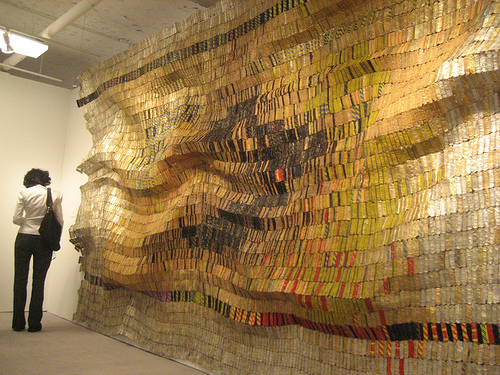 His work stood out in "Frequency" at the Studio Museum in Harlem last season for its sheer decorative vehemence. Here his conjuring of African ceremonial costumes, haute couture ensembles and coats of armor that have incorporated shields is even more diverse. Chairman of the fashion department at the School of the Art Institute of Chicago, Mr. Cave is 45 and knows something about sewing, draping, beading and quilting, and also scavenging, supplementing and adorning. He seems never to have met a floral pattern that he can't intensify with embroidery or, most often, sequins, which he dispenses lavishly. But he is equally adept with twigs, white string dipped in black paint, found socks and sweaters, dryer lint and Easter grass. And while he uses these materials in copious amounts, sometimes to grotesque effect, his garments always maintain a distinct and glamorous line. "The Thousand Faces of Mexico" on view at the Helsinki Design Museum (until 14 January 2007) is a massive survey of Mexican art drawn from two private collections. The first group comes from the holdings of the Austrian doctor Ruth Lechuga, who fled to Mexico during World War II, where she began to collect the crafts and textiles of indigenous Indian groups. Ms Lechuga travelled the country over the next 50 years, amassing a large collection of objects, including the largest collection of Mexican ceremonial masks in the world. The Design Museum is showing 500 masks, as well as examples of hand-woven cloths, embroidered textiles, lacquerwork and ceramics, on loan outside Mexico for the first time. 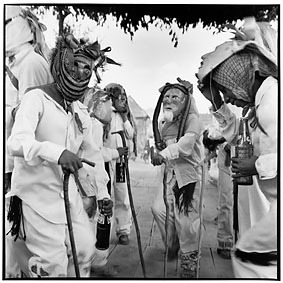 Also on view are photographs documenting Indian rituals, taken by Ms Lechuga during her travels. The other group is gathered from the collection of Franz Mayer, a German stockbroker who moved to Mexico in 1905, which includes art from the 16th to the 19th centuries, when Mexico was under Spanish rule. The objects on view combine rich local resources with the artistic traditions of Europe, such as coconut-shell goblets inlaid with silver and mother-of-pearl. The Arizona State Museum and the Gloria F. Ross Center for Tapestry Studies announced Tuesday the rollout of an online exhibition of Navajo textiles, Navajo Weaving at Arizona State Museum. Left to right: Wedge Weave Blanket, ca. 1880-1885 (Catalog No. 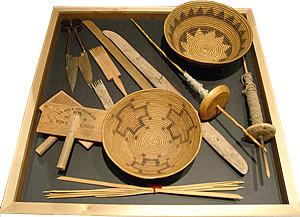 2004-747-1; Gift of Heather and Oliver Sigworth); Lillie Joe (c. 1940-), Teec Nos Pos Outline rug, 1984; A selection of historic weaving tools and baskets. Left & right photos, Jannelle Weakly. 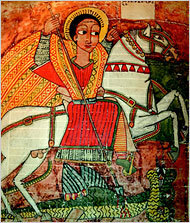 From an Ethiopian illuminated gospel, a scene of St. George slaying the dragon. Americans may be nervous about their borders, but the country's cultural horizons grow ever more global. 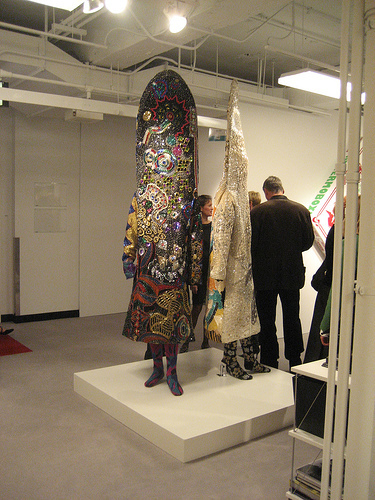 Witness the New York International Tribal and Textile Arts Show. With its confluence of galleries from Africa, Asia, Australia, Europe and North America, it's about Expansiveness with a capital E. At once low key and wall-to-wall gorgeous, it's my absolute favorite of all the New York art fairs. As installed at the Seventh Regiment Armory, the show has the feel of a cosmopolitan city laid out in a grid, Manhattan style. Walking its boulevards and byways, you change countries and epochs every few steps. You may start in Nigeria, but you soon move to Mexico, Tibet, the Pacific Northwest. An Olmec stone mask at Throckmorton Fine Art takes you back to 1000 B.C. A Coptic tunic adorned with slender dancers at Gail Martin Gallery brings you to the seventh century A.D. With oil painting by the contemporary Ethiopian artist Gera at Cavin-Morris, you arrive at 1995. By then hard distinctions between high and low, art and craft, decorative and functional have dropped away. Do such shifts and leaps leave you perplexed? Of course, and how great. Any art fair worth its salt should blow your mind at least a little, mess with your compass. One minute it should have you marveling at how everything from everywhere is connected, and the next it should have you thinking, "But I've never seen anything like that before." This back and forth never let up for me, and I loved it. But in the interest of less confusion-tolerant visitors, let me do some sorting. If your passion is for so-called classical African material, you have much to choose from. 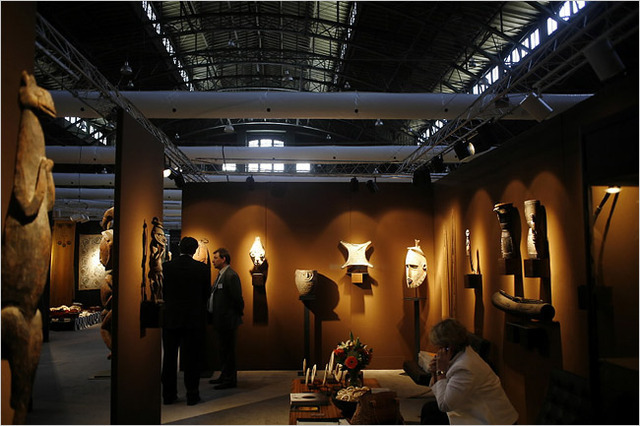 Dalton Somare from Milan has a textbook-worthy selection, as do J. Visser from Brussels; Oumar Keinde from Dakar, Senegal; and Joan Barist Primitive Art and Robertson African Arts, both from Manhattan. 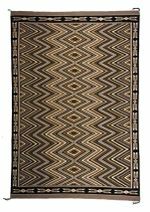 A north Persian kilim, from around 1900. At Barist, there's a masterly carving of a Baga male figure; with his chin resting on his raised hands, he's like "The Thinker" standing up. Robertson's prize items include two West African hunter's shirts hung with koranic amulets. These shirts are old and rare, but exactly the same protective charms can be spotted in news photographs of rebel soldiers fighting in Darfur today. 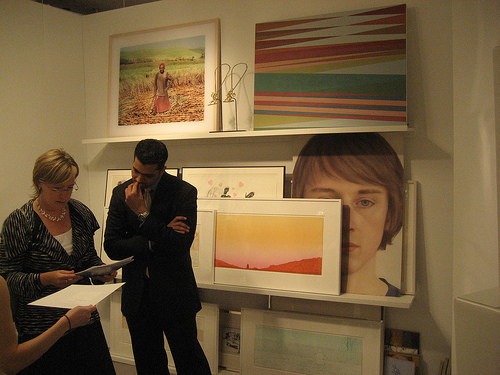 A few galleries specialize within the field. 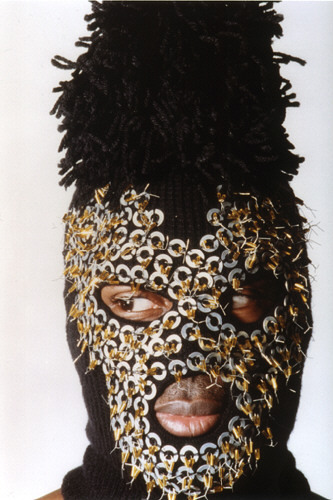 Axis, renowned for its exhibitions of Zulu beadwork, focuses on South Africa and has made New York history by integrating African art, old and new, into the fabric of the contemporary Chelsea gallery scene. Tana-Sachau Collection from Germany is devoted to Ethiopian Christian art, and the spiritual vivacity of the painted altarpieces at its booth is picked up by an illuminated gospel at Trotsky and Sanders. Maybe Oceania is your goal. Mark A. Johnson will take you there with a ceremonial dance mask from Borneo; its prowlike nose and big pink ears make it a kind of vertical hovercraft. Or you can zip to the top of the world with a suite of tiny prehistoric ivories at Brant Mackley, while Tibetan Buddhist bronzes at Hardt & Sons take you to a high place that some call heaven. Anyone in search of textiles will certainly find some version of heaven here. The variety of forms is endless, the craftsmanship superb. 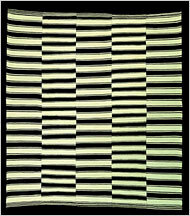 Let me point out, almost at random, a rainbow-hued Moroccan carpet, its pile as thick as moss, at Gebhart Blazek; a Turkish calligraphic piece — gold script against an emerald-green silk ground — at Esther Fitzgerald; and a multipanel north Persian kilim at Alberto Levi, with a slightly off-register pattern of black and white bands. But wait. Surely this is no carpet. It's a 1951 Ellsworth Kelly. And that marvelous wall piece at Gail Martin labeled "ceremonial cloth, Cameroon," the one with the looping penmanship patterns, is a Cy Twombly by some other name. 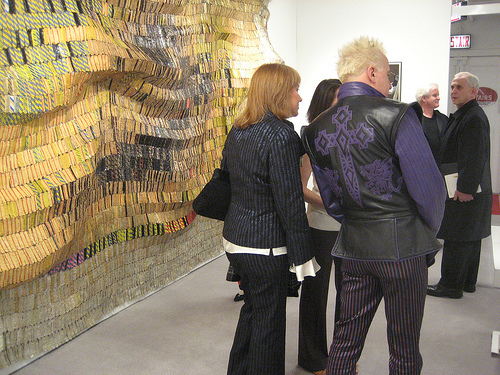 And isn't that that exquisite patchwork kimono at Thomas Murray an Anne Ryan collage, the largest she ever made? It is only natural to filter the unfamiliar art of other cultures through our own art. This is what everyone everywhere does, at least at first. The important thing is to go further, to let the unfamiliar grow familiar on its own terms. That's the dynamic the Tribal and Textile Arts show sets up, and it's so alive: art without borders, ideas in free flow, a politics of generosity, the only way to go. Organized by Eric Kjellgren, the Evelyn A. J. Hall and John A. Friede Associate Curator for Oceanic Art, in collaboration with Christine Giuntini, Conservator, both in the Department of the Arts of Africa, Oceania, and the Americas at the Metropolitan Museum. 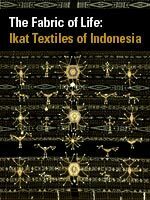 The diverse ethnic groups of Indonesia are renowned for the richness and variety of their textiles. 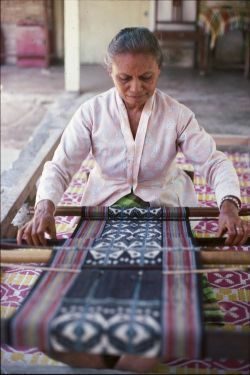 Created by women and used by both sexes, textiles in many Indonesian societies are both literally and figuratively interwoven with an individual's life from earliest infancy to the wrapping of the funerary shroud. This exhibition explores the imagery, forms, and functions of one of the most important, widespread, and technically sophisticated of all Indonesian textile traditions---the colorful and boldly patterned fabrics known as ikat. Drawn primarily from the Metropolitan's own collection, the exhibition includes ikat from several distinctive regional traditions. The imagery ranges from vibrant geometric compositions to figural patterns woven with astonishing artistic and technical virtuosity. This exhibition is made possible through the generosity of the Friends of the Department of the Arts of Africa, Oceania, and the Americas. A variety of educational programs will be offered, including family programs in English and Spanish, gallery talks, and a "Sunday at the Met" afternoon on March 26, 2006. See the online calendar for a list of programs organized by date. NSANGWA, Uganda - The shirt that Peter S. Kaboggoza had on the other day was nice enough, a bit worn around the edges but with all the buttons in place and no visible rips or stains. Still, it was a cotton-polyester blend, and that made Mr. Kaboggoza a bit sheepish when asked why he was wearing it. "Oh, this?" he said in Luganda, the local language. 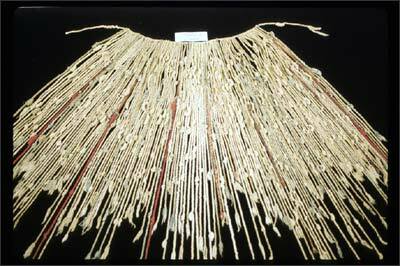 But the craft of making bark cloth is not dead yet. It is still possible, deep in the villages around here, to find old men, younger men and even children banging on bark. And Unesco recently declared the art of bark cloth making one of the world's endangered cultural practices. Augustine Omare-Okurut, who heads the Uganda National Commission for Unesco, acknowledged that he himself does not wear bark cloth when he goes out. But he said he uses it for wall hangings and place mats in his home, and wants future generations to appreciate the practice.